I must be behind on things…. but I just recently learned about “the olive theory” of relationships. The olive theory (from the show, How I Met Your Mother) in a nutshell: Marshall hates olives, but Lily loves them, and in Ted’s opinion, that’s what makes them a great couple; perfect balance. 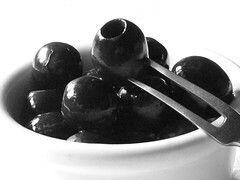 It’s like opposites attract… Brad hates olives, I love olives. It’s the same story with pickles. Not so much with onions… we both pretty much hate them. It’s not just about the foods that we like or don’t like, it’s about complementing each other. I hate making returns to stores, Brad doesn’t mind them in the least so he goes with me. I’m too short to reach the cabinet above the stove, he’s not. There are little things about couples where one person’s qualities help the other in some way. Can you see the 13″ height difference? Later in the episode we find out that Marshall really does like olives, but Lily says that they can make it work anyway. I, on the other hand, would be devastated if I found out that Brad likes olives and pickles because I really enjoy the extras when we go out to eat. What do you think? Is there really anything to the olive theory? This entry was posted in K-couple, My Life and tagged Conversation, Identity, K-Couple, marriage by Rachel. Bookmark the permalink.